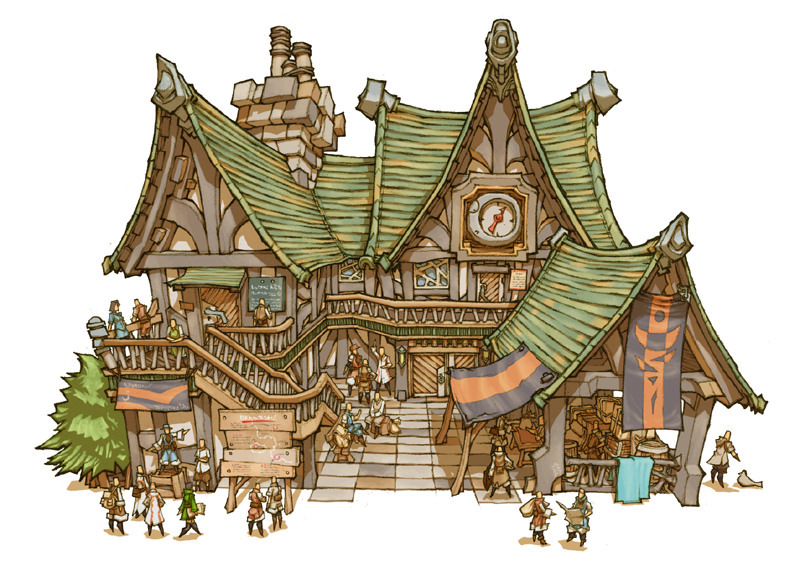 Welcome to the The Dragon's Scale, our lovely Tavern and Inn. Established nearly fifteen years ago by Lady Kadnissa Dorenka after she retired from adventuring, the Dragon Scale has been a prominent place to get together in Azuria proper. All sorts of alcohol from around the world is available. We rotate our menus out weekly, and what we don't have listed, just ask, we might just have it! The Scale isn't just a good place for drinking, it also employs the Divine Chef, who might just be the best chef in all of Azuria! She is available for cook-offs for those who think they have what it takes. The Kitchen is closed, though, after midnight so be sure to get your orders in before then! Drinks are served until 2 AM when the tavern closes. The Inn is open all night. Check ins and check outs can be done on the reverse side of the tavern, where there is a desk and staff member available to get you a room or key, or to receive a key if you are on your way out. We do have a jobs board posted up that can be taken by anyone. They are usually posted up by people who need something done. If you need to post something up, just let us know and we'll post it up. Jobs Notices can ask them to meet with you, or you can give us the reward and we will pay out when the job is completed. Jobs go up here. They can be anything from herb gathering, hunting, to more dangerous jobs. To post a notice, see Lady Dorenka or Zephora. All jobs are ranked by difficulty. Need someone to go out and get some game for me. Low on boar and elk. Payout is 2 Spears per pound. Deliver to Guild Kitchen. A night's stay in a room is two silver a night, and all rooms are high quality rooms. Zaxorie sighed and crumpled the paper in her hands. It made the all too familiar crackling sound as she balled it up. Normally she would cross out the mistakes to save paper but her sheet was filled with more crosses then legible words. She drew a fresh sheet and started rewriting. Zax had been at this longer than she'd like to admit but continued to try and finish the song for her upcoming concert. She originally came durring lunch but this particular song was being difficult. Looking down to her sheet there were only two lines of lyrics she was able to save. "Damn..." She muttered and tried reaching for her drink. She found the glass and raised it to her lips only to discover it was empty. She grumbled and raised her mug. "Another, please." She called and continued scribbling lyrics. Having spent but a short time in Azuria, Zyme had noticed a difference in this place that she had not among the small towns and villages that dotted the countryside. It seemed that this city was more accepting of beings outside that of humans, this at least gave her some sense of assurance that her presence would not be unwelcome. Perhaps she could actually spend time observing and learning more about humans rather than absorbing them. The shops along the market streets held little value for Zyme, after all she had little need of material possessions. As she meandered about the bustling square, she soon found herself standing outside the tavern she had avoided upon her previous excursion. Her drab cloak still draped loosely across her form, Zyme entered the establishment without a sound, save for a slight creak of the door. From beneath her hood, fluorescent eyes gazed across the many patrons, noting a few passing glances in her general direction but nothing to be taken as a threat. Zyme mingled about the room with an uncanny grace, soon standing just behind one particular patron that caught her attention over all others. A female with horns and a tail, clearly not human, scribbling upon parchment. She had never encountered a being like this before and just simply had to learn more to satisfy her curiosity. Leaning forward, Zymes head was soon hovering breathless like a ghost over the shoulder of Zaxorie , thoughtfully eyeing the piece of paper the woman seemed so focused upon. Zephora had been watching the musically inclined woman for some time. It was usually the time of day that most people were interested in drink than food, so she really didn't have much to do except play bartender. Not that she minded, it was something to do, anyways. The rainbow cupcake sitting on the bar counter was also watching with strange, beady purple eyes. The woman had been at it for hours, possibly. It sure felt that long, at least. Upon being asked for another, she smiled happily and grabbed the mug. Zephora turned and took a step, the majority of her body disappearing behind the counter, which would probably be alarming to most of the inebriated. Only about a foot of her was visible from over the top of the counter, the girl being only about 4'6. A fact that made carrying trays out , rather difficult sometimes. She grabbed a bottle and filled up the mug, turning and stepping back up on her stool and setting the mug back down. "Here you are." She glanced up to see someone come in, "Hi there! Welcome to the Dragon Scale! Take a seat wherever you'd like!" 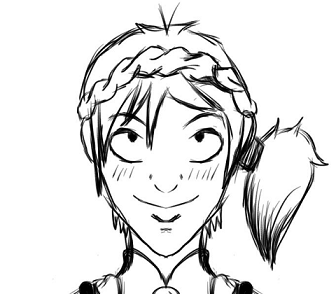 she smiled happily, then noticed the person creep up on the woman she just served. A little bit creepy, but knew the owner would get involved if there was trouble. Zax instinctively thanked the bartender and reflexively put four coins on the table still focusing heavily on the paper in front of her. She put her quill down and slowly drank from the mug, alcohol always helped her since it brought out her emotions but maybe she had indulged a little too much. Just like her last two she promised herself this one would be her last. With a small movement of her wrist she dipped her quill into the inkwell and leaned in before scribbling a few lines. The stream of consciousness that she was jotting down might have sounded good in her head but as she went to read over it she grew frustrated. "What am I thinking this doesn't even ryme..." She growled to herself and leaned up and knocked her head back feeling... something. The back of her head felt wet but not soaked. She slowly leaned forward and felt it disappear. She slowly turned around and stared into the eyes of the liquid girl before her, at least Zax guessed they were eyes and that she was a girl. Realising what she did her already pink cheeks blushed a darker shade, though her melodramatic midday drinking already made her cheeks darker. "Oh gods I'm sorry, ma'am?" She said apologetically making the last part a question. Common courtesy and etiquette were quite foreign to Zyme, or rather she simply found no practical use for exchanging pleasantries. 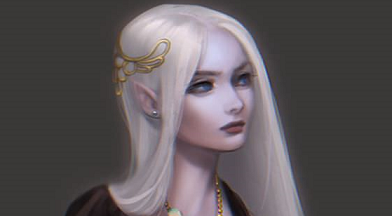 She had taken note of the small woman who had emerged from behind the bar, but her attention remained intently focused upon the horned woman and her musings. Zaxorie's head sunk back against Zyme's rather ample bosom, which no doubt felt peculiar. Her cool moist body offered little resistance as it molded to the shape of the teiflings head, slowly rounding back out to shape once Zax had turned to face her. For a brief and albeit awkward moment, Zyme did not respond to Zax's apology and subtle inquiry; besides, it was blatantly obvious that the amethyst fleshed creature at least appeared female. There was no expression across her face, no shame or embarrassment, nothing but a faint brightening of the glow of her eyes as they met the teiflings gaze. "I am call Zyme. Are you ill? ", Zyme asks suddenly, breaking the silence with a bubbly melodic voice. " Your face is warm." she adds while reaching out slowly, clearly wanting to touch Zax's horns if she would allow. " What are you? I have no knowledge of your kind"
Last edited by Zyme on Sun Dec 02, 2018 8:52 pm, edited 1 time in total. PRINCESS MYSTERICA The door to the Dragon's Scale opened, and a form glanced inside, pushing the door more open before entering. It was a relatively tall person, wearing a cloak with its hood up, but the way the cloak fell against its figure, it was apparently a female. She lifted leather-gloved hands and pulled the hood back, making her way towards the counter. Her skin and eyes were most unusual, reminiscent of opal gemstones that sparkled gently in the light of the hall. She reached back as she walked, brushing her hair back behind her out of being held by her cloak, her hair cascading down her back like liquid platinum. 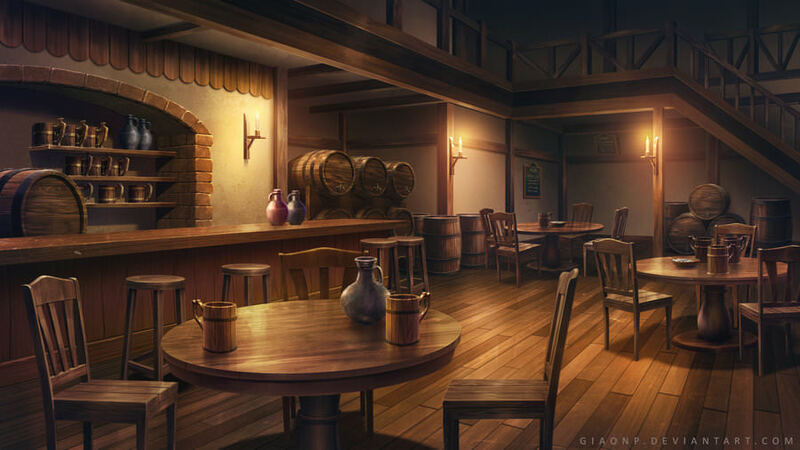 She gazed around the main hall of the tavern and started over to the counter, seeing two strange individuals, both rather facinating. She tried not too stare too much, moving up to the counter and sitting on an empty stool.